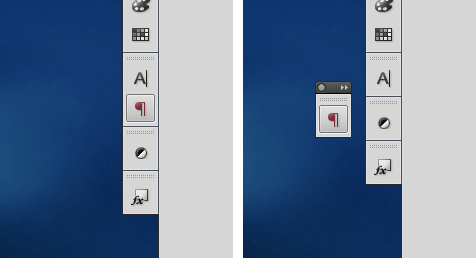 Quite often when I try to open a docked panel, I'll drag it off and spawn a new window. I assume that there's a minimum distance for a panel to be dragged before it detaches. It'd be great if this distance was larger. I assume others may have the same issue, even though some of us have been using Photoshop for years. Could be just me, but I do this probably once a week. Anyone else have this issue? It's not a big problem if you have "workspaces" properly configured. So panels could be returned in the place with just a click. But surely, Adobe could fix your issue just by changing 1-2 digits in their code. It's certainly not a big deal when it happens, just a minor annoyance. As you've mentioned applying a saved Workspace resets it. Marc, is this issue more of a problem when using a pen/tablet? My comments are for mouse use (I have a tablet, but don't use it often). I have most of my panels docked as they're shown in the screenshot, so I frequently open them. This means I move between the canvas and the vertical panel strip regularly, which works really well from a window management point of view, but means I'm hitting the panel buttons after a high velocity mouse move. Sounds about right. We're looking at a way to set the tolerance for this. I may drop you a special plug-in to test it out. You guys sure love to ask absolutely irrelevant questions. I frequently have the same problem and in my experience it's definitely more of a problem when using my Wacom pen/tablet. A slightly greater tolerance would certainly help this admittedly minor nuisance. Excellent. We'll see what we can do to improve this. Perhaps a checkbox that would allow the user to "Lock" the positions of the panels would be useful, similar to what Microsoft does in a number of apps where you can "Lock Toolbar(s)". I know what you're thinking... People would end up with their app in "Locked Panels" mode, then call Adobe support wondering why they can't move their panels. It would be handy, perhaps, to have a separate sound that would indicate you're trying to reorganize stuff when you have things locked down. Maybe even detect too many attempts to move a panel or whatever in too short a time and pop up a message, to help the user realize what's going on. But we wouldn't want the pop-up message the first time because that would just get in the way of continuing one's actual work. Yes this is a terrible problem really. I recently tried CS3 and it was so much better in this regard. The whole interface just feels very insubstantial now, like some kind of loose Flash implementation. Panels just flop around all over the place. This problem with the interface seems to get worse with every version. Having used Photoshop CS6 for a while now (daily) I'll say this: 99.9% of the time when I move a panel it's because I want to do so - for example to do a screen grab to show certain pertinent things. To return the panels to the arrangement I prefer in those cases (or the 0.1% where I accidentally moved something) I simply choose Window - Workspace - Reset Noels and everything's back where I like it. The tolerance was changed in CS6 so this should be less likely to happen. I still have this problem in CS6. Almost never happens with a mouse, almost always with a tablet. I have to have all my panels open otherwise I keep dragging them. I want a lock button so I can save some screen space and be able to press them and not drag them everywhere each time I try. I searched for the problem because I just can't stand it anymore! Disappointed to see it's "solved." I also don't see how this is solved. I concur with Mark Reynolds. There should be a switch to lock the interface. Most of the time I have no need to remodel or resize the workspace, and when I do it is by a workspace presets. For those of us working with a tablet, this is a needed fix. happens to me every few minutes when I'm in time pressure... not sure if such condition ever occures in other ad agencies. Like Noel said, you can do Window>>Workspace>>Reset Workspace, and I've added a keyboard shortcut for this, so when it happens I just press F6 or something really quick and everything pops back to where it was... just make sure to save your workspace at least once before reseting or you risk of reverting to the default PS setting.